On 4th Oct 2011, during the “Let’s Talk iPhone” greatly anticipated event, Apple officially introduced the iPhone 4S, the company’s next-generation iPhone offering a completely redesigned interior with a number of new features. The key differences are illustrated on red boxes. The iPhone 4S is also a world phone supporting both GSM and CDMA technologies, and also supports HSDPA download speeds of up to 14.4 Mbps, twice that of the iPhone 4.The iPhone 4S also included Bluetooth 4.0 for improved short-range wireless interfacing. Video can also be recorded at Full HD 1080p with real time image stabilization. The sensor takes in 73% more light than the iPhone 4, allowing for much better low-light performance. It also doubles the maximum HSDPA data speeds to 14.4 Mbps Which means faster connections, faster loading and reloading, and faster downloads. The iPhone 4S will be released to the US, Australia, Canada, France, Germany, Japan and the UK on Friday, October 14. Customers can also pre-order iPhone 4S on October 7. By the end of October, iPhone 4S will roll out to 22 other countries including Austria, Belgium, Czech Republic, Denmark, Estonia, Finland, Hungary, Ireland, Italy, Latvia, Liechtenstein, Lithuania, Luxembourg, Mexico, Netherlands, Norway, Singapore, Slovakia, Slovenia, Spain, Sweden and Switzerland. There is a high probability that the new iPhone 5 release will be quite a wait. Especially it is going to be very different in form factor. 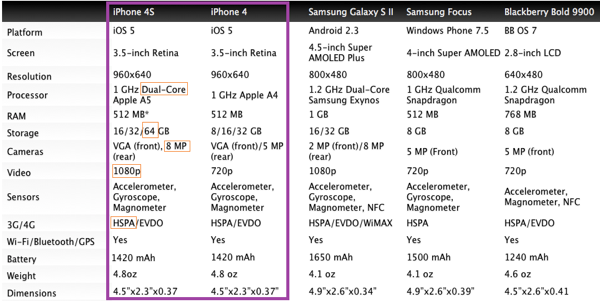 So, will you upgrade your existing iPhone 4 to the new iPhone 4S or wait for the mysterious rumoured iPhone 5?